Rapid Designs offers a range of selective laser sintering materials engineered to meet an array of defense, aerospace, medical, industrial and consumer applications. Rapid Designs offers a series of engineered Rapid Manufacturing Solutions under the brand name eRMS™. The initial line of eRMS™ products have met the vigorous demands of military and aerospace hardware. 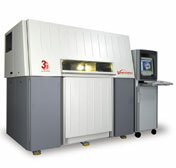 Selective laser sintering has proven its sea, land and air worthiness in numerous case studies. Rapid Designs processes several different base materials for selective laser sintering that can be enhanced by our proprietary suite of eRMS™ process improvements. CRP s Windform XT is a carbon-fiber filled polyamide laser sintering material. The natural color is carbon black. Windform XT has demonstrated superior performance characteristics in a wide variety of demanding applications in motor sport racing and other durable goods where exceptional strength and durability are required. Applications will target military, aerospace, automotive and medical customers. 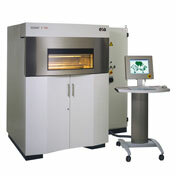 XT has tested to have superior electrical and thermal properties when compared to other laser sintering materials. Rapid Designs has independently tested Windform XT s heat deflection temperature (HDT) confirming use temperatures of 170°C (338°F) @1.82MPa (264psi) (ASTM D648). Windform XT s increased strength and HDT coupled with already proven light weight polyamide part applications will further expand laser sintering and direct digital manufacturing applications. PA Hybrid is a non-filled tough, durable engineering polyamide (fine nylon) thermo-plastic, with good heat and chemical resistance for producing parts that simulate production materials and applications. EOS PA 2200 – Fine Polyamide is the base powder used to formulate Rapid Designs LS Hybrid PA blend. This material has excellent surface finish, fine feature detail definition and long term stability. Best applications range from thin wall parts (.5mm), functional snap features and living hinges. Where engineering grades of polymers are needed in production, Rapid Designs’ LS Hybrid PA meets the critical mechanical properties of your application whether your application calls for rapid prototypes, or new on-demand digital rapid manufacturing. PAGF is glass-filled engineering polyamide plastic for creating extremely strong, durable and rigid prototype parts. 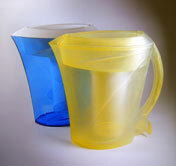 Rapid Designs uses EOS PA 2200 – Fine Polyamide as its base powder to produce LS Hybrid PAGF. This material has increased modulus and heat resistance. Best applications all have a common signature attribute: robust product performance and testing. Rapid Designs’ SLS Hybrid PAGF stands out where other RP technologies and materials fail to meet our client’s rigid engineering performance testing criteria. PAFR is fire rated non-filled polyamide meeting FAR 25.853. It has been engineered to meet the tough regulatory requirements for manned aerospace and commercial flight applications. Fire rating was accomplished with little offset to known laser sintered polyamide mechanical properties. Mechanical and thermal material characteristics are more than adequate for product development where fire rating is a factor to validate designs. LS FRPA is a homerun for rapid manufacturing applications. This material is “investment caster friendly” polystyrene for investment casting patterns. CastForm is compatible with the standard foundry wax removal processes. The process: Using customers “as cast” pattern 3D CAD solid model file the model is built in the SLS CastForm™ polystyrene powder. When initially produced the green pattern is 50% dense. The part is completed by dipping and brushing on red foundry wax. The low density of polystyrene and the use of high quality foundry wax that insures a clean pattern burnout. Investment casting suppliers prefer CastForm™ because it leaves less ash content after firing then epoxy or resin processes. All metals can be cast; Ti, Al, Mg, Zn. This material can be used to create flexible parts with rubber-like characteristics, for creating functional models. The parts are extremely durable and resistant to heat and certain chemicals. Secondary coatings and infiltration of polymer resins can significantly broaden prototype performance and customer applications. Custom formulated powder blends are batch characterized for on-demand inventory readiness. To insure the highest and most consistent product quality Rapid Designs’s quality assurance procedure requires testing of each batch of LS Hybrid material for each production build prior to processing. Inventory is managed to insure the highest quality powder to meet your rapid prototyping and direct digital rapid manufacturing demands. Rapid Designs has developed several proprietary custom processes to improve the material performance and applicability to meet our customer’s growing rapid manufacturing applications and rapid prototyping demands. eRMS™ (engineered Rapid Manufacturing Solutions) represents a suite of proprietary process and material improvements proving to significantly enhance SLS applications and material mechanical properties. Actual examples using engineered Rapid Manufacturing Solutions for product development have been under development and deployed for several years. A growing number of projects have been manufactured using Rapid Designs proprietary processes. eASF™ (engineered Advanced Surface Finishes) is a proprietary process applied to an SLS part. Rapid Designs technique smoothes the coarse, as-sintered surface. Smoothing SLS parts previously proved to be time consuming and costly requiring many hours of hand finishing. Applying coatings is made easier by this advanced surface finishing technique without adding significantly to part cost and process time. Not all parts and geometries are suitable for this process. Consult with your Rapid Designs RP specialist to learn more. ePAC™ (engineered Polyamide Composite) is a proprietary technique to apply composite resin systems to polyamide parts. Defense and medical customers have benefited by enabling them to use free-form fabrication design techniques saving time and money on tooling, lead time and fabrication costs. Click Here to Contact Rapid Designs for further assistance with your selective laser sintering material needs.